Editor's note: the article written by LI ZUMIN was first published in 1999. Talking about the sudden demise of the 10th Panchen Erdeni in Tibet 10 years ago, everyone I met expressed their sorrow by saying:"It was far too early”. Indeed, the 10th Panchen Erdeni was a great master revered by all. My first meeting with him took place in Lanzhou in April 1951, when I was working in the Ethnic Group Office of the CPC Gansu Provincial United Front Work Department. He was on his way to Beijing to pay tribute to the Central Government and assist in the negotiations with the local government of Tibet on matters concerning the peaceful liberation of Tibet. He impressed me as a smart and scholarly young man. In 1956, the 10th Panchen Erdeni visited India together with the 14th Dalai Lama. I was their interpreter. When we reached Sikkim on the second day, Indian officials and Tibetan separatists deliberately arranged cars decorated with the Indian national flag and the Tibetan military flag, known as "the snow mountain lion flag" for the two men. The 10th Panchen Erdeni refused to enter the car until the offending pennant was replaced with the PRC national flag. In the ensuing days, the master persistently and staunchly stood up for the Central Government. When the 1959 armed rebellion staged by those on the upper echelon of the Tibetan ruling class was put down, the 14th Dalai Lama fled the country, and the PRC State Council appointed the 10th Panchen Erdeni as Acting Chairman of the Preparatory Committee for the Founding of the Tibet Autonomous Region. During this period, I had many contacts with him. From the winter of 1960 to the spring of 1961, he visited Chengdu, Jingangshan(the cradle of the Chinese revolution), Shanghai, Putushan Mountain and other areas in southwest China, Jiangsu Province, Zhejiang Province and central south China. He was a Vice-Chairman of the NPC Standing Committee and he visited these places together with two others of equal rank-Li Weihan and Chen Shutong. The three discussed matters concerning Tibetan affairs all along the way, and the master raised many good suggestions. 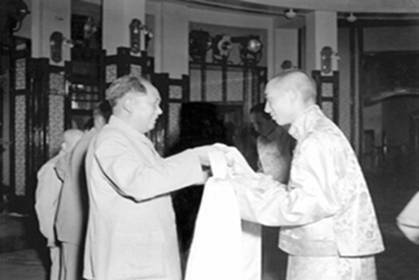 When Chairman Mao Zedong received him in January, he said he had come to full agreement on matters discussed with Li and Chen. During the trip, I worked as an interpreter. I admired his quick mind, outspoken attitude and serious working spirit. But, I also discovered he had a hot temper. In 1964, he was wrongly criticized and dismissed from his office, so that I did not see him for the next 15 years. In 1982, however, I accompanied him on his visit in Tibet and to Tibetan areas in other parts of China. While on state visits abroad, say, to Nepal and Brazil, I also served as his interpreter. This gave me many chances to chat with him while off duty. Gradually, we became good friends. LOVE,BUT NOT JOIN THE CPC. The 10th Panchen Erdeni often said: "Without the CPC, I wouldn't be in this position now." During his lecture tour of the Tibetan areas, he often spent half of his time explaining the CPC policies for freedom of religious belief. During my chat with the master, he said: "Had it not been for the CPC,I would have no political and religious position, I would not be able to return to Tibet, and I would not be able to become a state leader of the motherland. The KMT was good to the 9th Panchen Erdeni in life, but only gave him the honorific political title of 'Southwestern Border Commissioner'. Compared to this, the CPC is very good to me. Had it not been I would be the CPC, I would be a Living Buddha only, and that's all. I will repay the kindness of the CPC with my acts." However, the 10th Panchen Erdeni never ventured to join the CPC. He explained: "I love the CPC, but I refrain from joining it. This is the principle I follow. I worship Buddhism and have never thought of giving up my Buddhist belief.If I jointhe CPC,I would have to give up my religious belief. This in no way contradicts my love of the CPC. I will do my best to explain the CPC policiesfor freedom of religious belief in the capacity of a Living Buddha." The 10th Panchen Erdeni never forgot to take a few special articles with him wherever he went during the 1980s. They included one suitcase of gold Buddhist objects called Living Chamber Holy Things; one gold talisman box covered with embroidered yellow silk fabrics; and one square Xinhua Dictionary. As he often consulted the dictionary, so that all four corners were worn away. Hence,it became somewhat elliptical in shape. I asked him why he didn't buy a new one. He said: "It is my tutor, who assisted me in coping with that predicament. Soon after I was put into the jail, I was given a piece of paper and a pencil. I was made to write down the things I would like to have in the jail. I demanded a Xinhua Dictionary, and persisted in studying Chinese. I hate to say good-bye to my friend who shared my imprisonment." IRON CHAINS OF TANGDON GYAIBO. Tangdon Gyaibo had built many monasteries and iron-chain bridges during his life in the 15th century. He did all these things with the money gathered in the form of alms. He was also the legendary founder of Tibetan Opera. The 10th Panchen Erdeni showed great respect for Tangdon Gyaibo, and often mentioned him in his lectures. In 1985, when I accompanied him on his visit to Lharze in Tibet, where there was an iron-chain bridge that Tangdon Gyaibo had built, the 10th Panchen Erdeni told all present stories about its builder. Learning a blacksmith knew much about Tangdon Gyaibo, the masterwent to his home. The blacksmith revealed the family secret to the master, saying that he had kept one tool used by Tangdon Gyaibo and an iron-chain he had built. The blacksmith then unearthed the two treasures from under a tree, and presented them to the Buddhist master. The 10th Panchen Erdeni cherished the articles, and said they belonged to the State. The 10th Panchen Erdeni had created the China Senior Tibetan Language Buddhist College in Beijing for the training of Living Buddhas. He had a well-conceived blueprint for its future. Talking about his plan, he often said: "We will be able to succeed so long as we always work harder."